Yes, people kill people. But guns and laws make a huge difference in how many people get killed and the data clearly demonstrates the NRA and Republican narrative is myth-based fantasy, not fact-based reality. The following is an expanded chapter from the brand new short-but-powerful eBook Needless Deaths, Inexcusable Responses: Missives on Guns, Policy, and Politics in America, available on Amazon Kindle, Barnes & Noble Nook, and in ePub format! December 2nd, 2015 update: it is not without some satisfaction that I note that the short piece I wrote highlighting this data was deemed to be such a threat to “the cause” that the NRA officially wrote a response, one which, predictably, was rather unconvincing, engaged in a bit of ad hominem behavior, and actually did not even address the data in my article, their points not negating mine when the data is more closely examined than the casual presentation it is given in the NRA response (e.g., they write that in states with lower gun death rates, there are higher rates of other types of murder but fail to note that these higher rates do not come anywhere close to making up the differences between theoverall murder rates between states with lower gun death rates and states with higher gun death rates, or that European nations and othersdo not even come close to making up for the lower guns deaths in their countries with non-firearm deaths; see the NRA’s response here for yourself if you care to after going through my piece below). Like any dangerous product — cars, airplanes, explosives — sensible regulation of guns clearly plays a positive role in reducing both misuse of this product and the number of deaths resulting from such misuse. The map is not without exceptions and outliers, but the general trend is clear: States with more gun regulations had lower rates of gun deaths, and states with less gun laws had higher gun death rates, both in terms of suicide and homicide. That’s certainly not the message we get from the National Rifle Association (NRA) or from gun-rights advocates. Direct causation could not be determined, but at the very least, such a strong correlation should make it clear that existing public policy in many states with lax gun laws comes at a high price: more dead mothers, fathers, sons, daughters, brothers, sisters and others. In addition, higher firearm ownership rates were also heavily correlated with higher firearm fatalities, and lower ownership rates were correlated with stronger gun control legislation. Now, if you’re going to say, “Well, that’s just ONE study!” To that, I will retort that the Center for American Progress released another study in April that pretty much said the same thing, and that showed that 10 states with the weakest gun laws had over twice the rate of gun violence as the 10 states with the strongest gun laws. Also, in 2011, a writer for The Atlantic found, with the help of a colleague, that the presence of gun laws in states had a strong correlation with less gun violence, as the chart and map below also illustrate. An even more recent article from just a few months ago with excellent data visualization by National Journal staffer Libby Isenstein pointed out the exact same trend, and laid these trends out in several charts, one of which showed every single state ranked by its gun death rate and showing which states have gun laws/restrictions and which do not; the resulting trend is undeniable and obvious (as before): more laws and restrictions correlate with lower gun death rates. One point on these charts: you might notice that that Washington, DC, is something of an outlier for “states” with strict gun laws; that is because it is not a state, but a single city, and gun crimes in general are much higher in urban areas than in rural areas, and DC has no rural areas to balance out its average. Additionally, DC is neighboring and close to states with much laxer gun laws, which means that it is easy for people from those states to traffic guns into DC, and virtually all (e.g., 92.8% in 2010) guns used in crimes in DC are traced to these nearby states or others. DC’s tough gun laws over a city-size area can do little to stem weapons flowing in from surrounding jurisdictions (say, in Virginia) with lax gun laws. Comparing a city like DC to a state is a bit like comparing apples to oranges for these and other reasons. In fact, it is easy to single out numerous U.S. cities and find that they have comparable gun murder rates to some of the more violent “Third World” developing countries, which is disturbing and also an example of comparing two very different things. Some final food for thought: Building on an earlier Harvard study, a brand new study published in the American Journal of Epidemiology showed that the greatest factor that determines gun suicide rates by state was not mental health issues, but rather gun ownership. 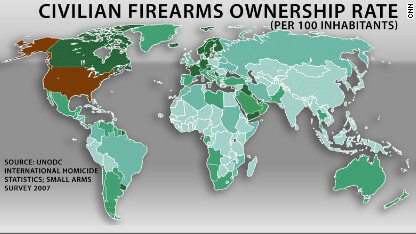 And when it comes to gun ownership rates, well, the U.S. is No. 1 by far. But sadly, we’re doing nothing at the federal level whatsoever when it comes to regulating guns; as Nicholas Kristof titles his New York Times column,“On Guns, We’re Not Even Trying,” thanks the alliance between the NRA and the Republican Party that is determined to do nothing when it comes to regulating guns. If you think I’m wrong (and by I mean these numerous peer-reviewed studies), the burden of proof is on you to provide counter-evidence. Not just ideology. If you are interested in reading the full eBook, of which this article is just one chapter, you can find it on Amazon Kindle, Barnes & Noble Nook, and inePub format. And, in general, do not hesitate to reach out to me or share your thoughts about the book on LinkedIn, Facebook, and Twitter (you can follow me there at@bfry1981)!